Buncho Co. Ltd. | A plannning and making company of crayon, solid marker, industrial marker. 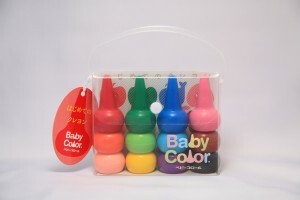 Buncho Co. Ltd. A plannning and making company of crayon, solid marker, industrial marker. As seen on:’MACHIKADO Information Room'(NHK). ‘BabyColor’ crayons are mainly targeted at children aged between 2 and 4. The main feature of these crayons is the distinct round shape that makes them easy to hold and draw with. These crayons are made in such a way that you can draw on paper with them without the color rubbing off onto your hands which is a huge benefit for young children. © 2019 BUNCHO all rights are reserved.